This unique property can be used as a private residence or a vacation cabin rental. Located in Saigon Bay next to Bocas Town, you can get there by boat or car making this a rare property. The views of the mainland mountains are spectacular and the crystal clear water is beneath you. 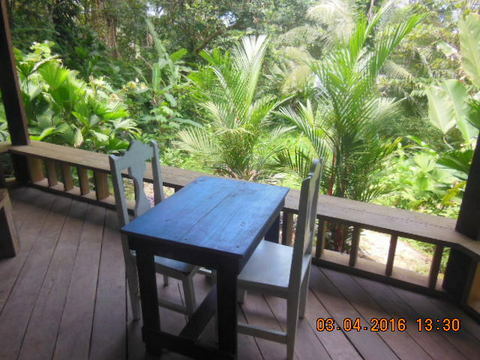 This 583 m2 or .15 acre has great potential as a small resort or long-term rentals. There are three over-the-water studio cabins. Each is 600 sq ft with kitchen, bath, living area and private deck. All are furnished with stove and refrigerator. On the land portion of the property, there is an office, shared laundry and single vehicle garage. The garage could also easily be converted into income producing. The property has all city utilities and there is a boat lift in place. This is Right of Possession property, in a Panamanian corp with application for water concession already filed. $600 monthly rent is average for each cabin. Put this income producer on your list for a must see.